Beautiful hand drawn old Bollywood poster of the Hindi film Rakhwala (1971) for sale. This is an actual surviving poster of the 1971 film that featured Dharmendra, considered to be the most handsome actor in Indian cinema at the time. 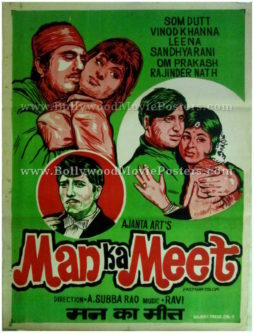 Printed and circulated somewhere during the release of the film, this hand painted old Bollywood poster was originally designed for publicity of the film but never ended up being used. 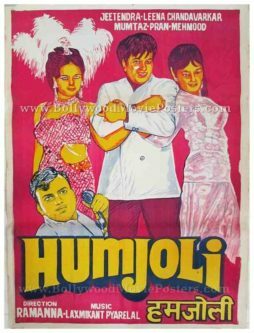 This poster was originally designed on a hand painted canvas by Bollywood film poster artist C. Bakshi, making it very collectable. This original vintage hand drawn cinema poster features Dharmendra and Vinod Khanna in action. Hand painted portraits of the lead actors are shown side by side – Dharmendra ready to fight with his bare hands and Vinod Khanna holding a pistol. On the bottom half of the poster, Dharmendra is shown delivering a karate kick. The film has a fiery flames background, giving it a true action feel. 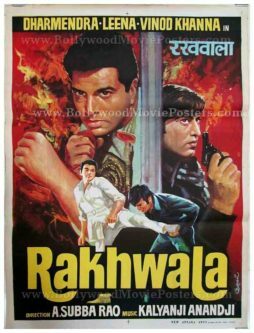 Rakhwala (Bodyguard) is a 1971 Bollywood film starring Dharmendra, Leena Chandavarkar and Vinod Khanna. The film comprises songs by the greatest Bollywood singers in history – Mohammed Rafi, Lata Mangeshkar & Asha Bhosle. 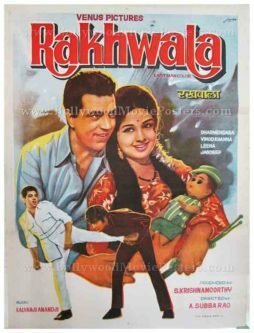 Beautiful hand drawn old Hindi movie poster of the Bollywood movie Rakhwala (1971) for sale. 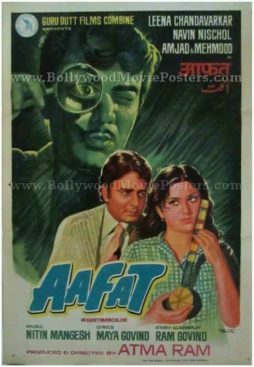 This is an actual surviving poster of the 1971 film that featured Dharmendra, considered to be the most handsome actor in Bollywood at the time. Printed and circulated somewhere during the release of the film, this hand painted vintage movie poster was originally designed for publicity of the film but never ended up being used. 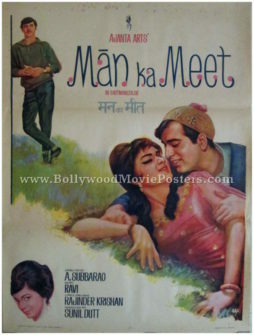 This original hand drawn old Hindi movie poster features Dharmendra in a romantic as well as action avatar. On the bottom half of the poster, Dharmendra is shown delivering a karate kick. The heroine of the film, Leena Chandavarkar, is shown clutching on to a soft toy.